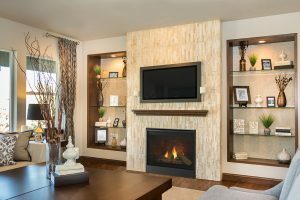 The multi-sided design of the American Hearth Premium Madison Peninsula Direct Vent Fireplace – 36″ gives you the ability to create a cozy and relaxing atmosphere in adjacent rooms. Choose between a realistic 12 piece log set or a mixture of logs and stones for your burning display. The included safety barrier screen will protect you and your family from accidental contact with the glass front, giving you peace of mind. You can add one of the interior liners to make sure your fireplace matches your style. 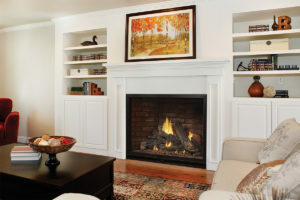 The American Hearth Premium Madison Peninsula Direct Vent Fireplace – 36″ can produce up to 34,000 BTUs keeping you and your guests warm and comfortable on cool evenings. If you desire full control over your fires there are various wall switch and remote control options available. Make your fireplace a true focal point for any room by adding a decorative front in nickel or bronze. 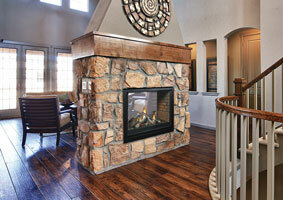 You and your family are going to love the addition of this elegant fireplace to your home.